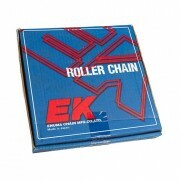 We carry a large range of chains in both British and American Standards. As well a speciality chains like Stainless Steel or Nickel Plated, Hollow Pin chain, O-Ring chain and Leaf chain. We have available off the shelf the High Quality EK brand of chain made in Japan as well as the economically priced TRP Chain that is made in China. 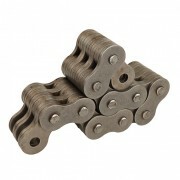 These chains are available in British and American Standard a full range of connecting links and crank links are also available. Environmentally Resistant Chains include those chains made from Stainless Steel and those chains that have been Nickel Plated. Both ranges are available in British and American standards as well as Conveyor series chains. Ware resistant chains include X-Ring Chain, Super Hi*Power chain and Sintered Bush Chain. 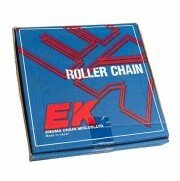 These chains are available in a verity of sizes in both British and American Chain as well as Conveyor series chains. 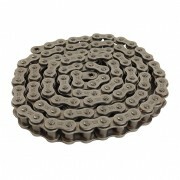 We many carry different speciality chains like Hollow Pin chain and different sizes of Agricultural chain. Side Bow chain is another chain that fits in to this category. Leaf Chain is primarily a lifting chain and cannot be used for Power Transmission applications. Its most common application is on Forklifts but many other lifting operation use leaf chain to help lift products or machine parts from one level to another.